Kitty Burnham and Family, Second Edition. Photograph by Thomas Rice Burnham, early 1860s. Published by the New York Photo. Co., 454 Broadway, N.Y.
Who was Kitty Burnham? And why did she and her kittens get their own collectible photograph? 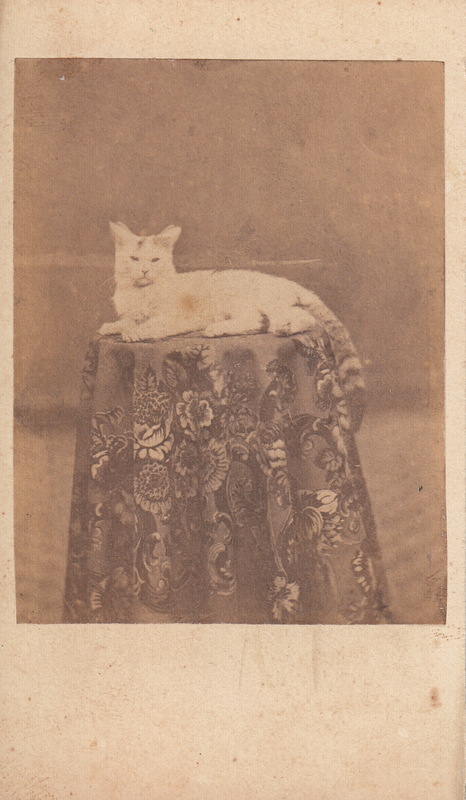 This little “carte de visite” (“CDV” for short) photograph was offered in at least two editions. It dates from the mid-1860s (I know of one example with a Civil War tax stamp (1864-1866). 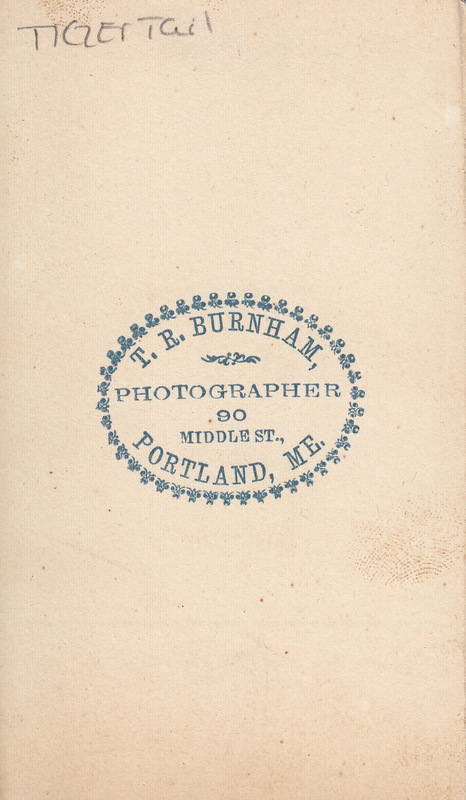 Another “second edition” of the photograph credits T. R. (Thomas Rice) Burnham, 247 Washington Street, Boston, as the photographer. Kitty Burnham apparently belonged to Burnham, a New England commercial photographer whose portraits can be found in many collections. He was, according to his colleagues, “a very unique character” and some of his doings, including experiments with very large glass plate negatives, were reported in the era’s photography club magazines. Burnham began his career in Portland, Maine and spent some time in New York, but by the early 1860s had moved to Boston, where he had a series of studios up and down Washington Street until the early 1880s. Burnham made his living from commercial portraiture, especially CDVs, which were made using glass plate negatives. This meant that, for the first time, customers could order as many copies as they could afford. Burnham may have sold this edition of “Kitty Burnham and Family” to the New York Photo. Co., but whether he took the portrait in New York or Boston is also unknown. CDVs ushered in the era of the photograph album. People collected not only images of friends and relatives but also photographs of celebrities, popular prints and paintings and promotional images that were sold cheaply or, perhaps, given away by photographers anxious to attract business in what was often a crowded professional field. There are many CDVs of popular lithographs depicting cats and dogs. My guess is that Kitty Burnham’s picture was at first a promotion and then became a collectible card. The trimmed corners of my copy, which has faded over time, suggest that it was indeed inserted into an album. Kitty Burnham? (“Tiger Tail”). Carte-des-visite by Thomas Rice Burnham, 90 Middle Street, Portland, Maine, early 1860s. Back of the portrait of Kitty Burnham (“Tiger Tail”). This may not have been the first time T. R. Burnham published a photograph of Kitty Burnham. I found this carte-des-visite, published by Burnham in Maine before his move to Boston, and the nonchalant expression, spots on the head and tiger tail of this cat look like Kitty Burnham to me. 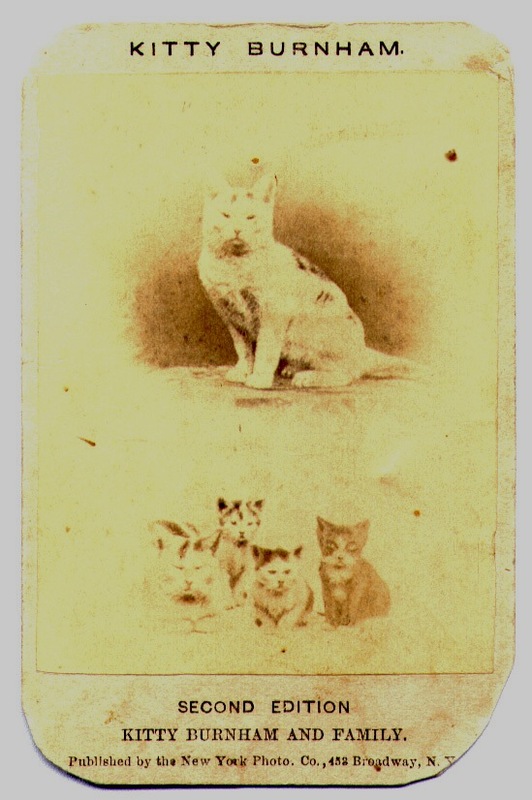 The back of this card has a pencil inscription — “Tiger Tail” — but its author and date are unknown. This was another album filler and publicity card for Burnham, but when you put the two cards together, they suggest a long and affectionate relationship between T.R. Burnham and Kitty. If you know something more about Kitty Burnham, I hope that you’ll share your information with me and the readers of this blog. Previous And Here’s Someone Who Really Wanted His Picture Taken…..